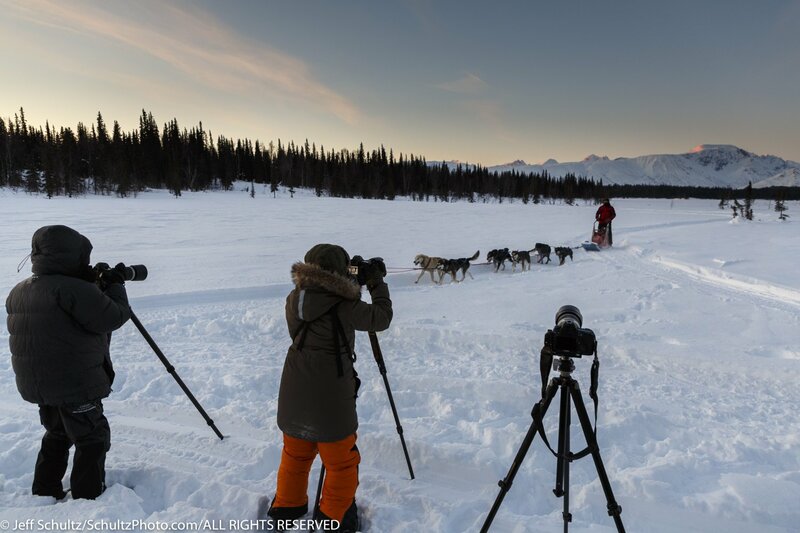 Experience a rare and epic winter adventure that combines photographing dog teams and winter landscapes with night-sky and aurora pursuits under the northern sky. 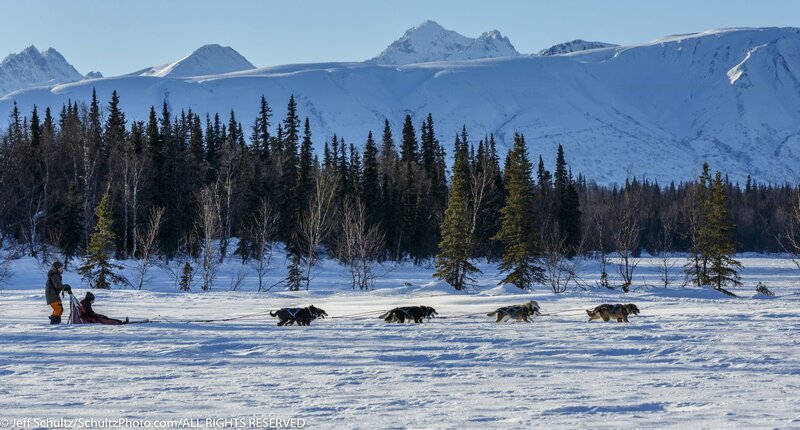 During this photo tour/workshop, you’ll be guided by one of Alaska’s most published professionals, Jeff Schultz, official photographer of the Iditarod Trail Sled Dog Race. 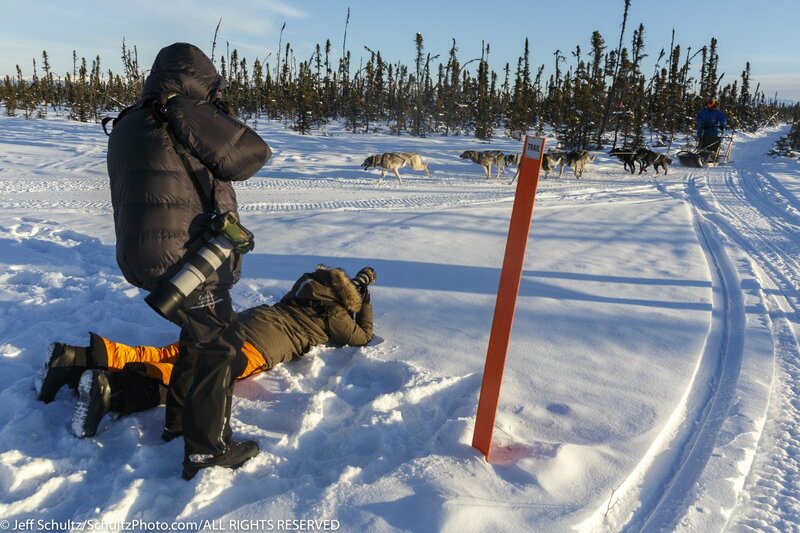 After a half-day of photographing the excitement of photographing 3 dog teams in the forest around Iditarod Champion Martin Buser’s kennel & training area, we’ll photograph winter landscapes and night-skies in the beautiful Matanuska-Susitna Valley. 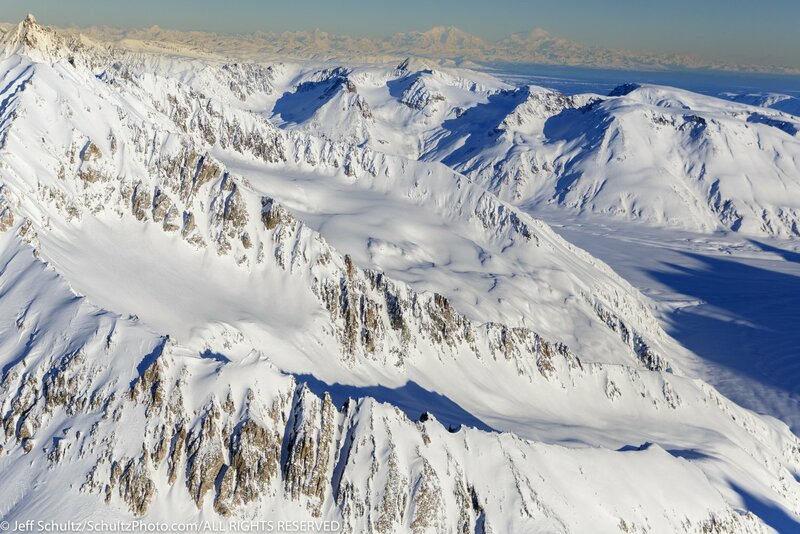 The following day we’ll take a 45-minute ski-plane flight over glaciers and next to snow-covered mountains for aerial photos. 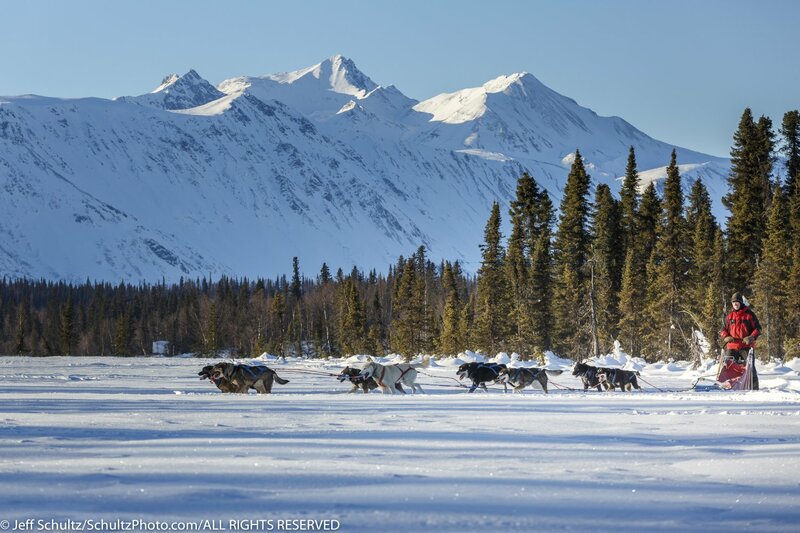 We land on a frozen lake at the most prestigious lodge on the Iditarod Trail, the award-winning Winterlake Lodge. 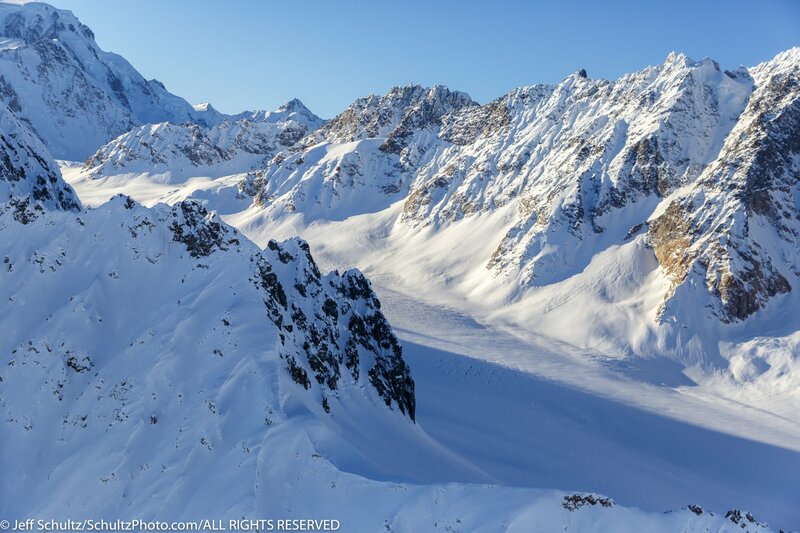 Nestled in the foothills of the Alaska Range, the lodge provides unparalleled hospitality and cuisine in one of the most stunning locations on earth, and will be your accommodations for the remainder of the trip. 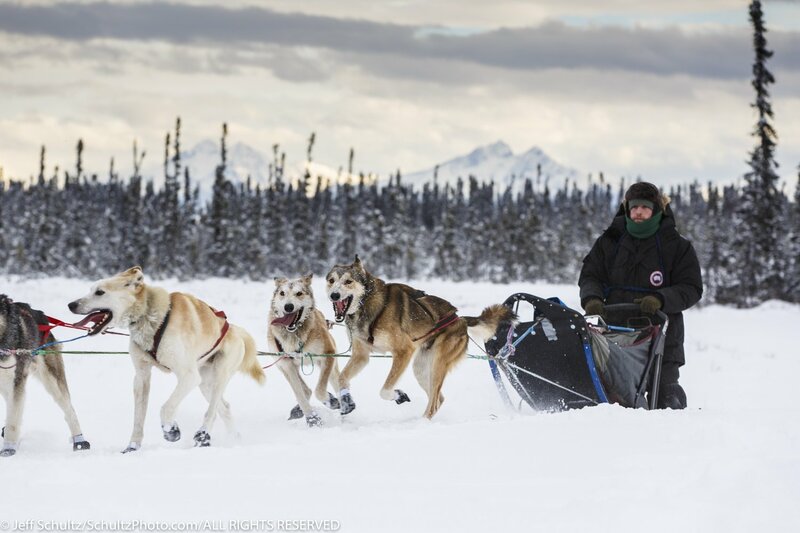 There will be opportunity to photograph the lodge dog team surrounded by pristine mountain peaks. 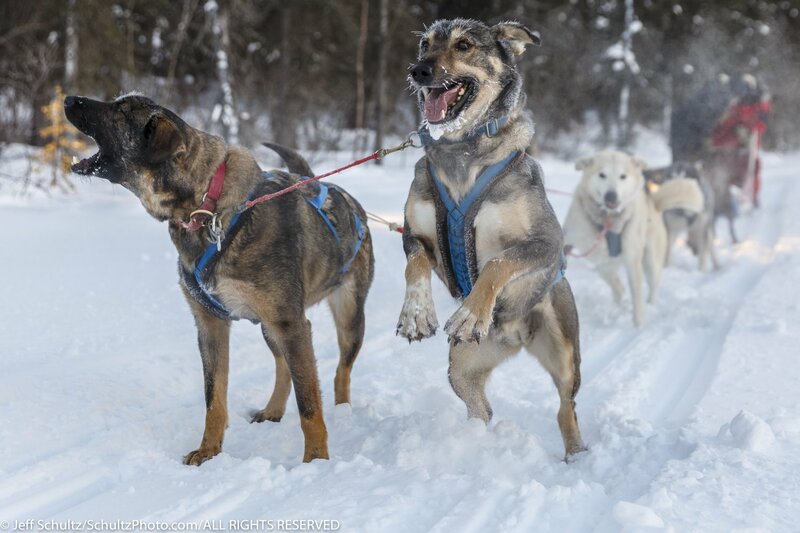 You will also have the opportunity to mush the dogs yourself as well as get up-close shots of the lead dogs as you pace in front of them lying in a sled pulled by a snowmobile. 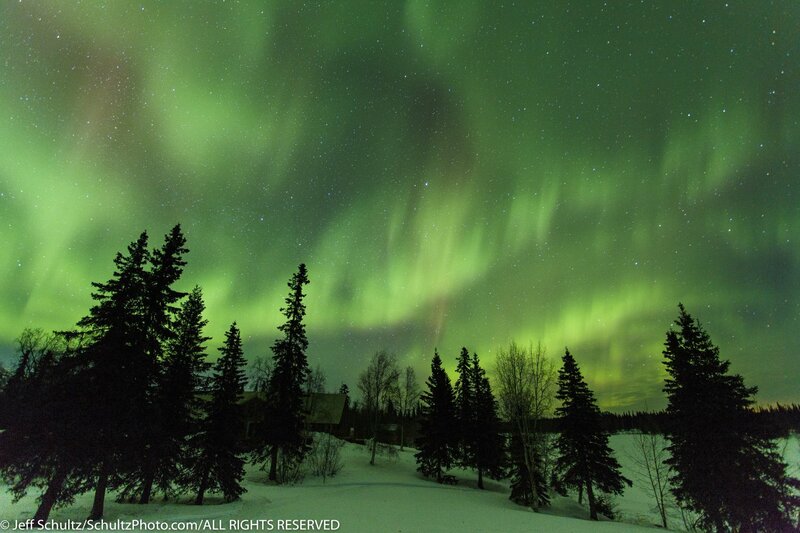 During dark hours, weather permitting, you’ll have a chance to photograph the night sky and possibly aurora displays. 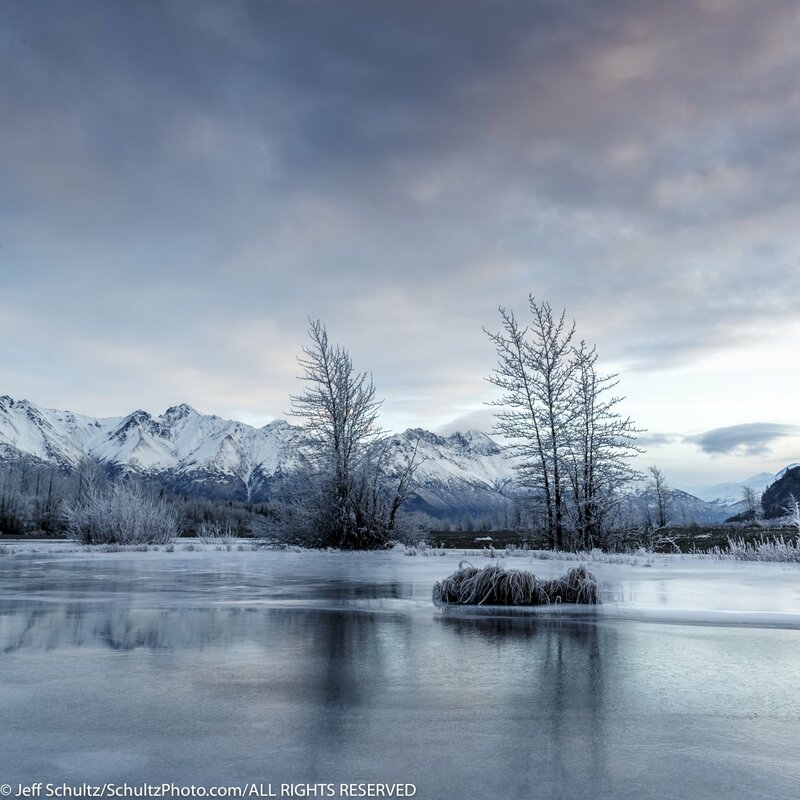 Throughout the workshop, Jeff will provide teaching sessions, photographic support and area expertise to ensure you get your Alaska dream shot. 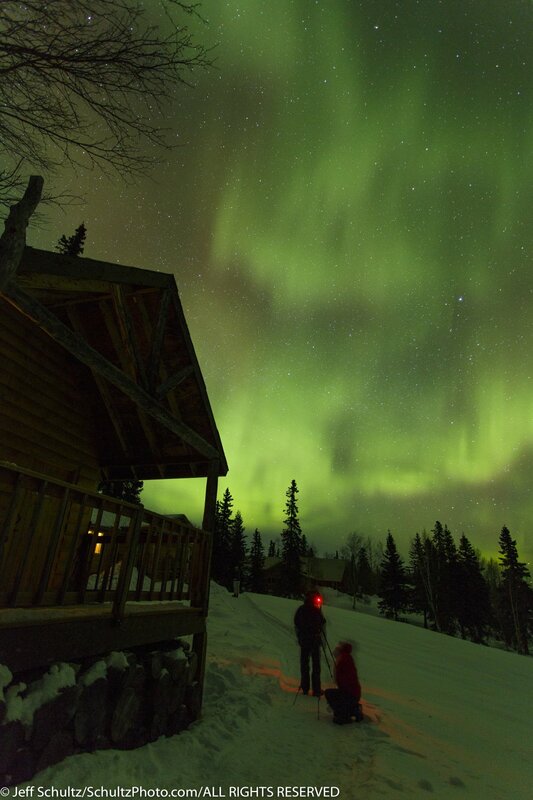 Cost is inclusive of all meals, transportation, transfers, guides, and lodging from Anchorage. 5 days/5 nights $4985 per person double or single occupancy. 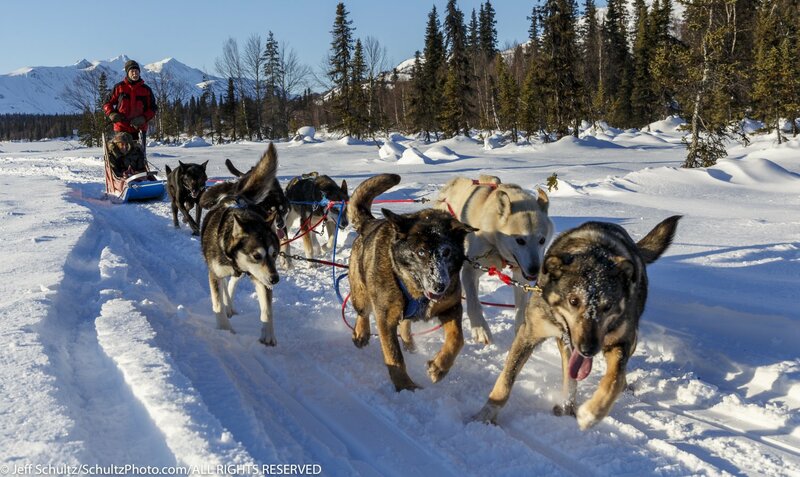 Includes Thursday night presentation & Anchorage hotel plus 1 night in Palmer, Alaska and 3 nights at Winterlake Lodge through Tuesday afternoon. NOTE: During this trip the sunrise is 9:04 am and sunset is 5:24 pm gaining 5+ minutes each day. Thursday February 7th. 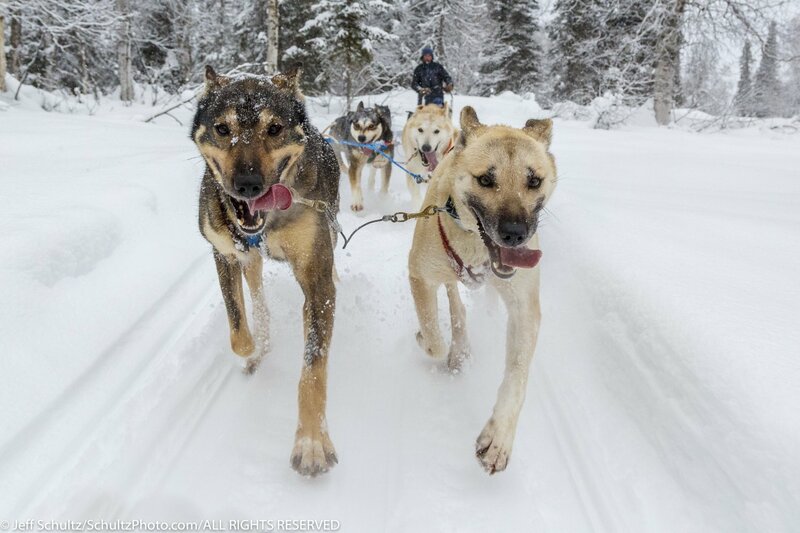 Evening get together and presentation in Anchorage on photographing dog mushing. Heavy appetizers and beverages including wine & beer served. Begins at 4:00 pm, ends at 8:30 pm. Thursday night at an Anchorage hotel for those from out of town. On your own for locals. Early morning: 40 mile drive to Big Lake, Alaska to Martin Buser’s kennel. Late morning photograph 3 dog teams on a varied terrain course. Travel by snowmachine to 7-8 various locations to photograph the teams with different backgrounds and trail. 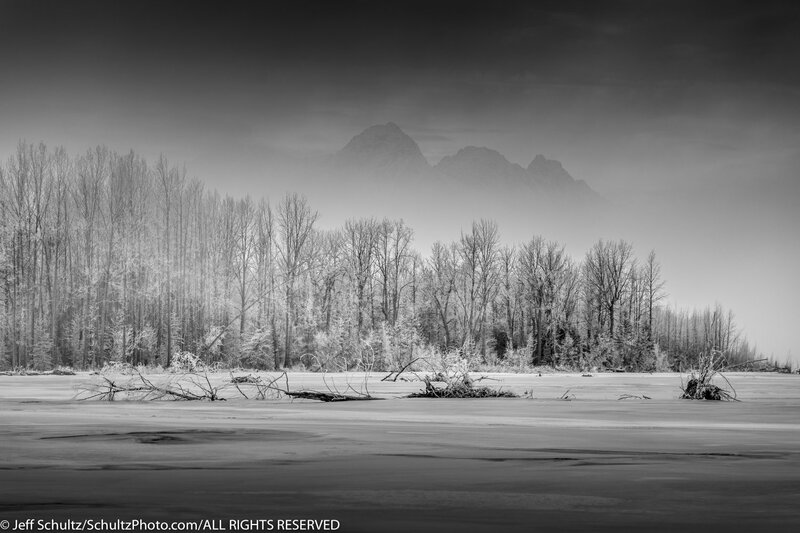 Early morning winter landscape photography. Evening – appetizers and gourmet dinner at Winterlake Lodge. Breakfast, lunch and dinner at lodge. 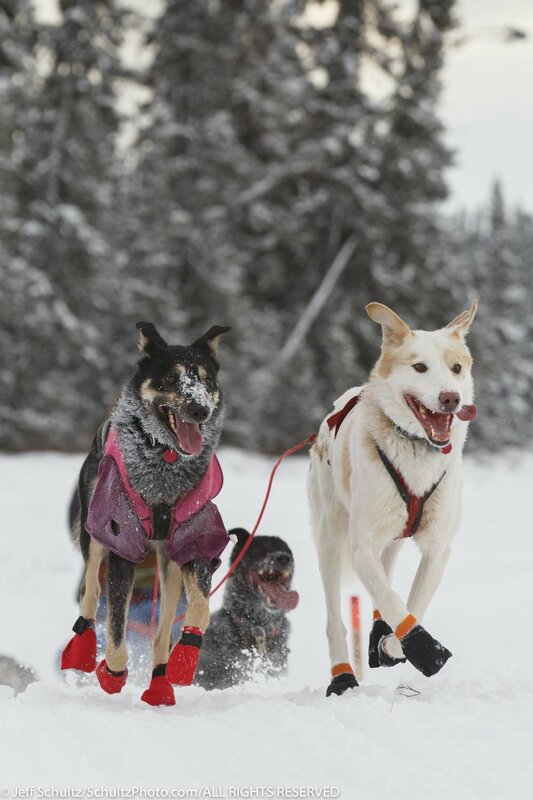 Morning and day time—we will use the lodges’ dog team as models for photographing and provide the opportunity for you to ride in the sled for a unique perspective as well as mush the team yourself if you so choose. Also there is a variety of lodge activities and photography of same including, snow mobiling, snow shoeing, cross-country skiing. Late night and early morning is potential for night-sky and/or northern lights photography; weather and conditions permitting. Sunday early evening will be additional instruction time on night photography and painting with light and/or time for editing & processing your images and/or Lightroom image processing demonstration as the group wishes. Monday night we will have a slide show of the participant’s images. Breakfast and lunch at lodge. Depart early afternoon for Anchorage. Besides shooting with two Canon camera bodies, Jeff brings lenses from 14mm-400mm and flash with off-camera capabilities, tripod, polarizer and split-neutral density filters. Graduated Neutral Density Filters: Jeff carries a 2 and a 3 stop “soft” and "hard" filters by Breakthrough Photography. A complete list of camera gear will be sent prior to the workshop. a complete list will be provided prior to the workshop. Ground Transportation is provided in a 12-passenger van. Our Anchorage hotel is 4-star and located on Lake Hood, near the airport. Please be aware that your luggage allowance for the ski plane is limited to 60 lbs (27 kg) per person (incl. hand luggage). Additional luggage can be stored in Anchorage. * All flying is done “weather permitting”. 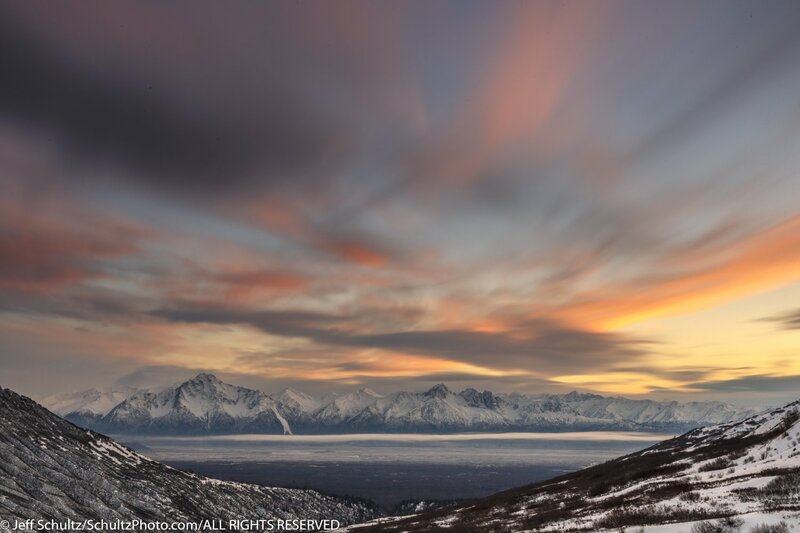 In Alaska, the weather can be changeable. This means that in bad weather, certain activities and/or transfers (e.g. bush plane, helicopter) may be delayed, or unable to take place at all. In these cases, we will adjust the adventure to do what we can for the weather we have. Jeff Schultz Photography and our lodge vendor & air-taxi is not responsible for flights that are cancelled due to weather and/or weather delays. Any personal gear. 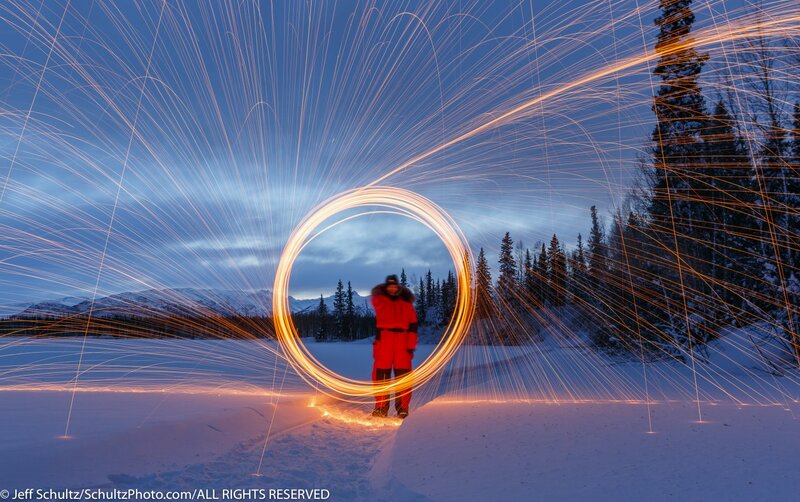 You must bring your own photography gear, clothing, toiletries and outerwear. Your safety is ultimately our primary concern. We use some of the best Alaska pilots and each carries the necessary full insurance as required. 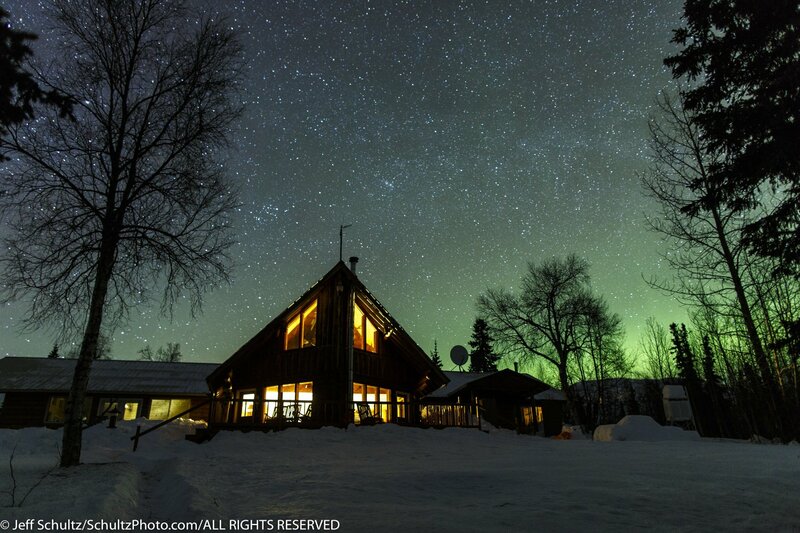 Likewise the lodge carries complete insurance and are qualified for Alaska backcountry living. Weather Conditions: Moderate to extreme. February temperatures range from 30° F (-1° C) to MINUS -20° F (-29° C). May experience snow, wind or sun. I like to tell people; if you can stand in one place for an hour and not be cold, then you have the right gear. Mental Requirements: A flexible and positive attitude is a must. 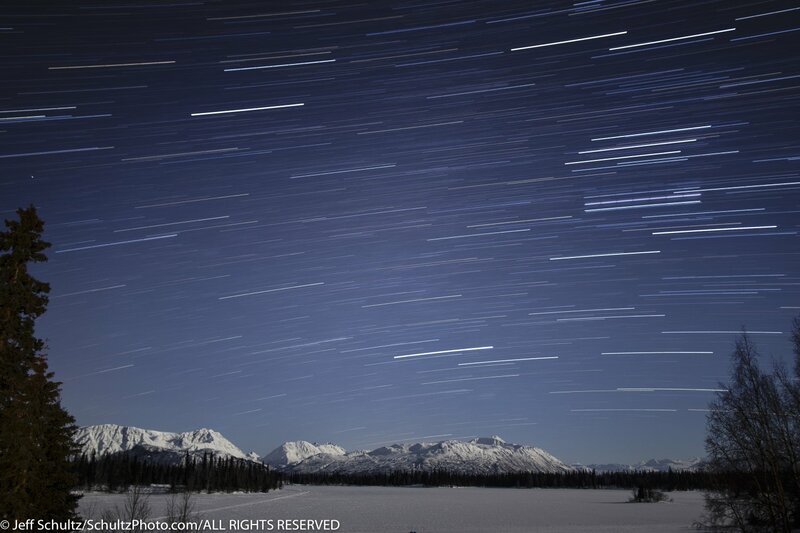 It’s winter in Alaska and likely things won’t run exactly according to plans. Clients are required to inform us of health problems, allergies and physical limitation at booking due to the extreme remote location and physical activities involved. All clients must sign a liability release waiver prior to the trip. The balance of the tour price is due December 1, 2018. An invoice for the balance will be sent 30 days prior to that time. Payments can be made prior to this date as well. Reserve your place by clicking the “Book Now” button and entering your information on the next page. We’ll contact you with payment and confirmation information. Read Booking Policies and Liability Waivers. After the deposit payment is received, Jeff will send detailed information on the first day’s itinerary so that you can plan your arrival day and time. a list of any other essential personal gear & any specialized photography gear he feels will enhance your experience. more detailed information on the itinerary, if any.